This includes two products. 1. An "I have who has" game with the long and short E sound spelled "ea". There are 31 different cards. 2. 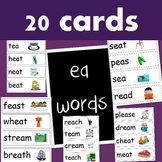 A word sort with the long and short E sound spelled "ea". This can be used as a station for reading centers, partner work, small group, or RTI groups. *EE and EA sound* Very FUN package! Made for independent work! I made this during a prac in a grade 2 classroom to work on sentence writing with the low achieving students. Each picture inspires a sentence about a word with a long 'ea' sound in it.